This Collection Utilizes Sleek Lines With Laser Cut Oval Accents. This is Used To Achieve A Perfect Balance. The Polished Nickel Finish Contributes To This CollectionS Refined Beauty. The Mona collection illuminates with a quiet sophistication perfect for a both transitional and contemporary dicor. Magnificent ivory paneled shades sit atop polished nickel arms that extend gracefully from a solid base enhanced by clear crystal detail. The cornerstone of the satin Collection is quality, and this chandelier is no exception. Combining a classic nickel finish and posh styling, you will find no better way to highlight the charm of your home. With the superb craftsmanship and affordable price this fixture is sure to tastefully indulge your extravagant side. 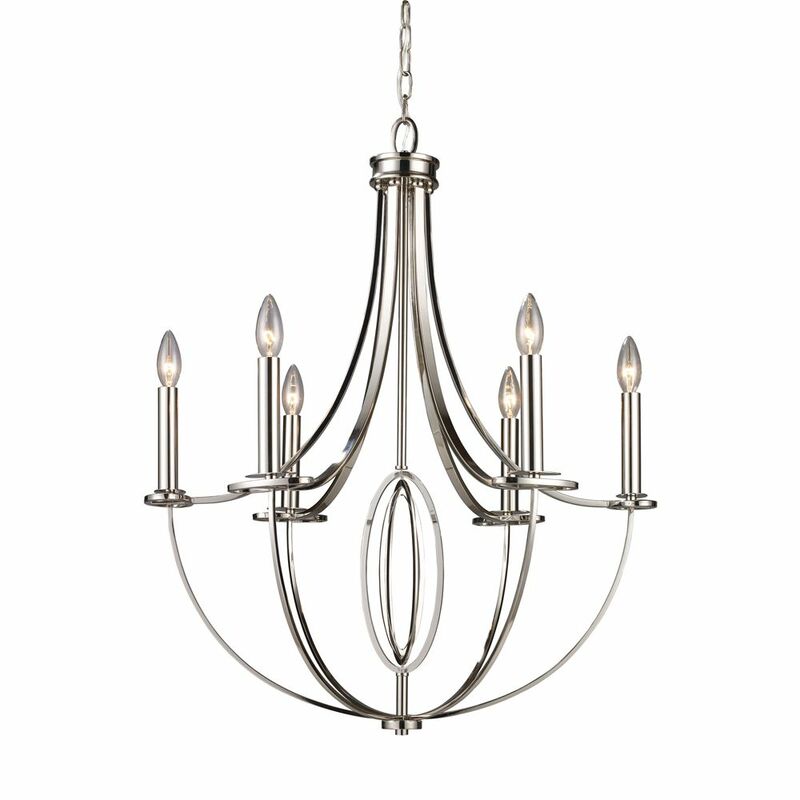 6-Light Ceiling Mount Polished Nickel Chandelier This Collection Utilizes Sleek Lines With Laser Cut Oval Accents. This is Used To Achieve A Perfect Balance. The Polished Nickel Finish Contributes To This CollectionS Refined Beauty. 6-Light Ceiling Mount Polished Nickel Chandelier is rated 1.0 out of 5 by 1. Rated 1 out of 5 by Joann from Poor quality Love the look of this chandelier, but when we were in the process of installing it and inspected it closely, we found that the "candlesticks" were not straight and there was no possibility for adjustment. Returned it to the store!